Nothing like a 5-game August skid to ruin my mid-summer. As the Boston Red Sox continue their recent (for lack of a better term) slump, I'm left to wonder if the Boston way of doing business, is the right way? Sure, two World Series rings in five years is better than the rest but is it good enough now? Before the Yankees turn today into Sunday, Bloody Sunday I've decided to attack my misery head on, you know like David Ortiz attacked that steroid issue . . errrrr maybe not so much that way. We get it, you've spent it. I'm going to admit it, the spending New York has done has had an immediate impact. $16.5 Million for A.J. Burnett this season has got the Yankees 10 wins and set them up for a few others. Burnett is a work horse and can pitch against the best of them. A.J. has notched 123 strikeouts which is good for 9th in the A.L. and allowed just 120 hits in 22 starts, better than the likes of Felix Hernandez, Justin Verlander, and even Roy Halladay. C.C. Sabathia and his back loaded contract giving him just $15 million this season has won 12 games for the Yanks this season. Sabathia is 4th in the entire Major Leagues in innings pitched, if your going to pay another start upwards of $15 million a year he better be starting every fifth day and getting past the fifth inning, two things Sabathia does. Then there is the masterful 2-hit, seven and 2/3 innings, shutout of the Boston Red Sox yesterday afternoon. Worth every penny. Finally, the $20 million plus being shelled out to first baseman Mark Teixeira. The newest Yankee is hitting just 0.016 shy of .300 to go along with his 28 homers and 82 RBI. Any question why the Red Sox were trying to acquire the former Ranger, Brave, and Angels slugger? The protection Teixeira gives Alex Rodriguez has been evident and will only help to give the Yankees the toughest 1-2 punch since the days of Ramirez & Ortiz. Deep pockets has its benefits, you got me. Their rotation is rounding out. After witnessing the starts of Burnett & Sabathia, any Red Sox fan has got to be a little squeamish. The reason the Yankees didn't make a strong push for Halladay and or Cliff Lee? They are fine exactly where they are. Timeout: Allow me to point this out to you. As a member of the New York Yankees pitching staff, one does not need to have an earned run average south of 4.00, it isn't needed. Currently the Yankees represent the Majors best record at 68-42. Damn advanced thought, the Yankees have more wins than anyone yet rank 18th in team ERA. This staff doesn't need no-hitters they need inning eaters. (insert C.C. Sabathia weight joke) Back to it . . . C.C., A.J., & Joba all anchor the Yankees staff with earned run averages from 3.67 to 3.76 and that is all they have to do. With tonight's starter Andy Pettitte slotted as the #4 starter on the staff the Yankees are asking him to do one thing, get to the pen intact. As always with any staff you've got to stay healthy but if they do, with home field playing at that bandbox of a new Yankee Stadium, it'll be tough to get out alive. Why didn't the Yanks go out and give up prospects to lock down Halladay? They simply didn't need to. While the Boston offense is looking to get off the mat, the Yankee offense is scary. Sure their new digs help 'em out in the homerun department (6 hitters with 15+ homers) but the Yanks are a top five team in batting average, total bases, homers, and rbi. From Robinson Cano hitting .314, good enough for 10th in the American League to Johnny Damon on track for a career high in homers (20) with nearly two months remaining in the season, the Yanks are turning it on offensively. The captain, Derek Jeter, has 19 stolen bases to go along with his .312 batting average, getting on base and pushing the issue while on base is a science Jeter has perfected. The 2009 version of the Yanks isn't just A-Rod, Teixeira and the usual suspects, it's Nick Swisher the right fielder whose already slapped 18 homers and drove in nearly sixty runners. It's the 37-year old veteran Yankee catcher, Jorge Posada hitting .281 nearly 60 percentage points better than the Red Sox veteran catcher, Jason Varitek. It's the newly acquired Eric Hinske who provides the Yanks with even more pop off the bench 5 homers in 11 games. The Yankee offense doesn't let up and for teams like the Angels, Tigers, and yes even the Red Sox, it's a scary reality. Were we stand . . .
Jon Lester has to turn in a good night. Seven innings, two earned runs on five hits then leave it up to the pen. Coming off two straight masterful pitching performances by Yankees C.C. Sabathia and A.J. Burnett, Jon Lester has to assert his status as a forceful #2, now more than ever. With uncertainty surrounding the departure of John Smoltz to triple A ball, the season-long uncertainty around Daisuke Matsuzaka, and the currently laid up Tim Wakefield, the once deep Red Sox staff consists of: An Ace, the corpse of Brad Penny (5.20 ERA), the question mark that is Clay Buchholz, and of course Lester. The Red Sox have seen their American League East lead evaporate since the break and are now on the verge of watching their American League Wild Card lead do the same. 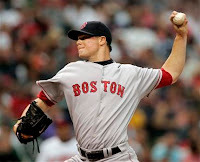 Sunday night baseball is the stage, his foe is veteran lefty Andy Pettitte, and Jon Lester must deliver for the BoSox. Making me feel better: Lester has struck out 17 Yankees in two starts this season. Now excuse me while I prepare to watch game 4 of this bloody weekend series in the Bronx, with one hand over my eyes. From Ashes . . .